Courtesy Of The Aleksandr Solzhenitsyn Center. Solzhenitsyn in Cavendish, at his self-made table with birch legs. Aleksandr Solzhenitsyn, the world-renowned, Nobel Prize-winning Russian author and political dissident, lived a long life filled with hardship and contemplation. 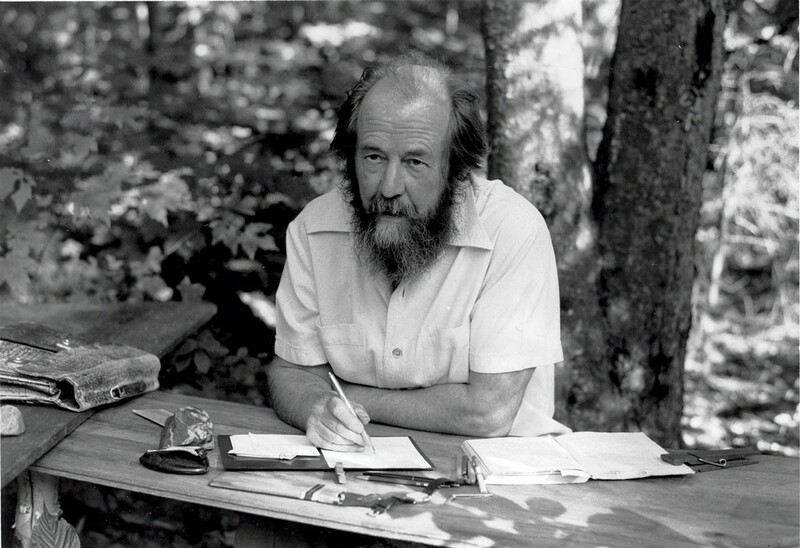 Seventeen of those years were spent in the tiny town of Cavendish, Vt.
Now on view at the Vermont History Museum in Montpelier, the poster-and-photo exhibit "Solzhenitsyn in Vermont" aims to shed light on the writer's life and legacy, with particular emphasis on his time in the Green Mountain State. "[Cavendish] pretty easily could be considered the address [Solzhenitsyn] had the longest anywhere in his life," said Margo Caulfield, director of the Cavendish Historical Society and author of the biographical children's book Aleksandr Solzhenitsyn: The Writer Who Changed History. A little more than a year ago, Caulfield began working with the Aleksandr Solzhenitsyn Center in Worcester, Mass., the Vermont Historical Society and the University of Vermont to bring the exhibit to fruition. The timing is appropriate: 2018 marks the centennial of Solzhenitsyn's birth. This year will also see the publication in English of The Red Wheel, the author's multi-volume opus about the Russian Revolution. In October, the Solzhenitsyn Center will release his autobiographical account Between Two Millstones: Sketches of Exile, 1974-1978. In 1962, Solzhenitsyn published One Day in the Life of Ivan Denisovich, a novel set in a Soviet labor camp. The author himself had been imprisoned in one of these from 1945 to 1953, for having described Josef Stalin in derogatory language. His novel Cancer Ward appeared in 1966 and was banned in the Soviet Union the following year. It and In the First Circle (1968) were both published in English outside the USSR. Solzhenitsyn was exiled from Russia after publication of The Gulag Archipelago in late 1973 (the English translation appeared in '74). He and his family first lived in Switzerland. After being hounded by paparazzi, they set their sights on Canada. But, as Solzhenitsyn's wife, Natalia, commented in an oral-history interview for the Cavendish Historical Society, "although Canada is a most beautiful country, it is somewhat like a pillow. It is a little too boring, and it is too far removed both geographically and in terms of culture." Solzhenitsyn settled in Cavendish in June 1976 and was joined by Natalia and children Yemolai, Ignat, Stephan and stepson Dmitri in July. The appeal of Cavendish, according to UVM professor and Solzhenitsyn scholar Kevin McKenna, was "first and foremost, the seclusion of Vermont." He continued, "The Cavendish area is very reminiscent of the kinds of places that Solzhenitsyn associates with Mother Russia: rural, beautiful, tranquil — small, country environments." A secondary attraction was the town's proximity to Dartmouth College and its academic libraries and archives. It would seem that Solzhenitsyn found the privacy he sought. "He really kept to himself," said Caulfield. "He was here to write; he was here to raise his family." Caulfield, who moved to Cavendish in 1992, described the protective attitude that townspeople took toward their famous resident. "It was a wonderful secret that the town shared: We know where he lives, but damned if we're going to tell you." One photo in the exhibit shows Cavendish store owner Joe Allen posing beside two signs. One reads, "No restrooms, no bare feet." The other: "No directions to the Solzhenitsyn home." Upon the author's return to Russia in 1994, the sign was removed. Solzhenitsyn died in 2008 in Moscow. To this day, though, Caulfield said, "Nobody's going to give you directions to his home," which Solzhenitsyn's children still own and use. "One of his biggest legacies to this town was his kids." Caulfield, McKenna and others aware of Solzhenitsyn's literary significance hope to kindle further awareness of the writer and his works. "He was much more known into the early 2000s than he is at this point," said McKenna, who is currently at work on a manuscript about Solzhenitsyn's unique use of the Russian language and its proverbs. "That's why this centennial will be a shot in the arm in terms of making him more known in the area." Caulfield put her primary hope for the exhibition in plain terms: "I hope that people read his work." The Cavendish Historical Society has its own Solzhenitsyn presentation, featuring pictures from the family, videos, oral histories from Natalia, Natalia's mother and her sons Stephan and Ignat, and artworks honoring Solzhenitsyn. Caulfield noted this will become a permanent exhibition when the society relocates to the Cavendish Universalist "Stone" Church. "Solzhenitsyn's whole life had a magical quality," Caulfield said. "This is a man who followed the hero's journey." "We as a historical society have a real responsibility to future generations to record and accurately provide information," she continued, "because, as the years go by, the number of people that knew him dwindles." The original print version of this article was headlined "Exile in Cavendish: An Exhibit Documents Solzhenitsyn's Vermont Years"